Will deliver anywhere between Corner Brook and St John's. $500 each. From Elaine Pinard's unique breed an exquisite mix of submissiveness, wild beauty and friendliness. Beautifully submissive as trusting and friendly as one could ever hope for ... they don't know how big they are. One big shy guy, the other smaller and light as a seagull. Raised Anyko from 3 weeks and the very robust Akita shy guy from 3 months. Perfect "fun spirited" they dance play fight and love all day. Have been sleeping inside most of the time, so they have leaned to hold "it". Raised in harness on a run line Anyko has not been without a sibling since birth. Perfectly socialized. A constant acrobat body language between them. They have always been together. The "Big Guy", Atika ( Gentle Bear ) or whatever name you like ... is similar to how I often call them "HaKita" like Hallo (hello) and the ending of the Blackfoot word for "little horse" ( Ponokamita ); like a yodel I use to bring them home from a late night freedom time - I let huskies go at night - have for 25 years. A territory gives them a life. The smaller brother is compact and delicate - with yellow eyes a ring of blue stars in the yellow band wolves do not have blue eyes, but brown or yellow. Born with the distinctive black patch half way down the tail. The small brother has a given name of Anyko meaning "Spirit of the Forest" names chosen by a Micmac friend. Sounds with strong consonants really get there attention - like a mouse squealing ! or the "click" in clicker training. I do not train Siberians to sit, or lie down - I do train them to come and stay. Nor would I train a horse to sit or lie down or expect a Seagull to to do the same their heads are in the clouds - and that is why we love them. (necessary reading I believe). She is a behaviorist who trained Dolphins, her kids, her boss, and her partner. Anyko is dominant. Atika is the big shy one. One day he,ll become aware of his size and Anyko better watch out. I let them wrestle play-fight and fight - I let them learn from each other -settle their disputes themselves - their play pretty rough and wild ( closest to the wolf of all breeds - they teach each other hunting skills ) It's frightening if you did not understand to let THEM finish - their status seeking drives, and rough play between themselves. They know what they are doing - we don't ("The Other end of the Leash"). They jump up and kiss on the lips you will have to break that with your knee if you choose. Allowing the kissing and licking establishes you as parent and superior. I let them gently lick and chew my hands and arms - gentle it is affection. We use language to form social bonds, pet with our hands, they use licking and chewing a gentle exquisite dexterity with their teeth - often preening ones hair or skin - affection through their teeth and kisses THEY LISTEN: the slightest discomfort a little shout/cry from you and they break off or become more gentle. Both are friendly to everyone - amazing to see. Completely trusting of you - can be handled physically - in any trusting way. Can be trusted with bones or food when ANY PERSON is near. Submissiveness to people has been bred into them. Have never been struck. Never strike an animal for discipline - it all depends on how much trust and closeness you desire, how much you wish their free spirit to speak. I do believe there are times for firm aggressive discipline but of a kind that does not "come from you" - but is immediate and originates from their action ( cause and effect ) a threatening aggressive discipline can be delivered - but it comes from a consequence of THEIR action - it does not come form you. Every time you strike them their spirits move permanently further away. The best way to discipline them, to lower their status, is to isolate them - alone away from all social contact. It is the worst non-violent form of punishment. Fed them wild food fish, fish oil, fish meal, eggs and lots of bone - raw or cooked - meat and raw liver. Trust them with bone. I've raised dozens of Siberian Wolf cousins over 25 years on bone - bone all day every day - they are not a domestic breed - they are a wild loving breed. A Neurological condition does not allow me to handle them the way I used to. Mostly outdoors - they are tough but do love a blanket, a couch or your bed - you can see them smile. Last 3 photos are close up of mother FOREST; father SARGENT in focus left - snow runner pulling sled; last is SARGENT with his Leader ... Mother Musher and Breeder Elaine Pinard. Call to discuss their personalities/temperament further. The large male is - very large - very gentle ... noble ... DOES NOT LIKE BEING ALONE. Spirit of the Forest is totally comfortable alone. 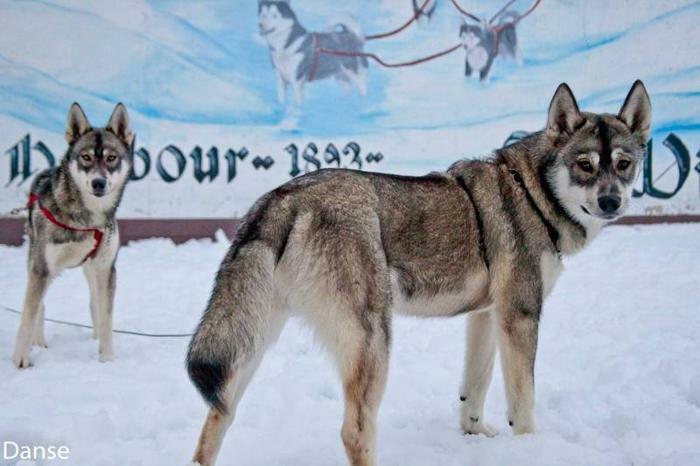 A strong noble working breed from a working sledding pack. Young Female Dog - Retriever Siberian Husky: "Annie"